This was pretty busy day and so at 3:30pm I am just now getting to writing my blog post! I have been working on creating a pretty complex frame for a mask concept. I am part of a group on Facebook with a lot of cool and talented artists and each month we have a theme that we vote on. This month the theme was blue and so I thought I would work on a blue mask. I had a lot of trouble coming up with an idea, but after much thought, decided to work on a Leviathan mask. Leviathan is in many different myths from Biblical to Babylonian to Greek. 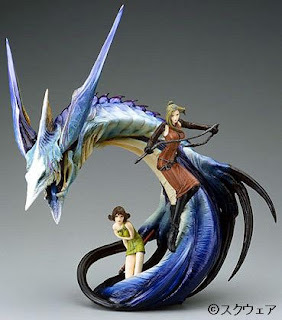 It's depicted usually as a dragon, but the game Final Fantasy turned it into a sort of sea serpent. This is the version I'm going with and more specifically the model used from Final Fantasy VIII (8). As you can see, this is far from the simplest design I could have picked, but the thing I love most about mask making is the problem solving part! There are many ways you can do them and figuring out how is so fun -- for me at least. Let's get started on making a frame! Picture frame backs or chipboard is useful if you can find it too. So, I started by breaking down the model on this statue that was released for the game. You can see the parts of the face: a diamond shape in the center, a sharp tip and almost rectangular sides, a central fin, and 2 big wings on both sides. Adapting it to a human face is something you just have to make judgement calls on. The way I do it may be different from how you would do it. For the base part of the face, I came up with a pattern that looks like this drawn on cardstock and cut out. Make sure you label them too so that you don't get confused later. I got this shape by trying it on continually. The cardstock is also very flexible so you can wrap it over your face easily. Check your eyeholes, check that everything looks right before continuing on. If you have a friend, it really helps to try it on them too! Tape it to their face and make sure everything looks exact! When you're done, trace the patterns out on some cardboard. For this specific pattern and because the beak is so sharp of a point, I wanted to use a material that would not get flimsy when wet like cardboard does. I used the back of a picture frame (I think it's made of chipboard) to cut out the central shape for this reason and it is not the easiest thing to do. I went back and forth between the xacto knife, the scissors, and my husband's pocket knife! For any piece that you want to be easily mold-able, use the cardboard. Keep in mind, that the cardboard you trace this pattern onto will not be as flexible as the cardstock until wet. Also, make sure you use your Xacto knife to cut the cardboard. It work way better than the scissors! Once it's all cut out, you can start to shape it a bit and tape it in place with your masking tape. I use masking tape because if you screw up, then you can easily take it off. It's good for temporarily holding as well - like when you're tracing. Do the same thing you did with the cardstock pattern, and squish and bend the cardboard to make it fit right. But don't worry too much about it being rigid, as I mentioned before that it will loosen up quite a lot when you add your material to it (papier mache or plaster wrap cloth). To keep the cardboard from jutting out on the sides, I kept it taped with a long piece of masking tape in approximately the right shape. Next, I made the central fin pattern, and traced that out on cardboard two times. I fitted it and cut off any excess. You find that making your own patterns is a lot of trial and error. I had to cut a little divot in my fin pieces because of the dip in between the V shape at the top of the head. Once it was all secured, it's now starting to look more like Leviathan! I'll now go on to follow the same routine to make the wings on both sides of the helmet style mask. You can use this method to bring just about anything to life, but it is especially helpful for hard, straight edges -- like the pointy beak, fin, and wings. You can always build upon it as well with something like celluclay as I will with this mask to work in details. Once this mask is finished, I'll be sure to link to it here so you can see the finished piece. After writing this post, I'm realizing that I still haven't explained how to use something like plaster wrap cloth or paper mache to cover a frame like this and make a mask. I'll be sure to write that for you guys next week and I can even use this mask to show you! Thanks for Reading and Happy Creating! Please leave a comment if you have a moment! Ok, this is an actual comment, not a 'bot reply or other spam. I found your blog because I was looking for tips on using plaster cloth, which I recently bought. My main reason for getting it was to build dioramas for live showing my Breyer model horses, but I also want to use it for making my Witch King armor. I recently finished the helm from paper mache, and while it turned out great, I'm thinking plaster cloth will give it more durability. And I can cut the basic shapes I need for the finger lames (plates) and other parts of the gauntlets easier from the cloth than trying to tear pieces of newspaper to the right sizes and shapes. Off to watch your video on using the cloth on your mask (Cool design, by the way! ).